Operating Days: Open Wed- Sun 11 am – 5 pm June – Sept, every day April- May, and Oct: only weekends. Want to go for a glide? Try out Segway at our Test Track or come along on a nice Segway tour through our beautiful city. We have three tours every day together with certified instructors. At our Experience Center you can rent Segway (individual) or come along for a nice Segway tour. Segway tours three times a day. Glide along the river of Götaälv at a speed of up to 20 km per hour. Feel the wind, see places you would not otherwise get to. Our tours are always guaranteed at least 60 minutes of lovely Segway driving together with trained instructors. For your safety and service. You have three tours in Gothenburg to choose between. Open daily from June 1th. Read more and book through our booking site, e-mail or call us. See Gothenburg from a new perspective. Glide through the beautful park of Slottskogen, the old Haga, Masthugget, past the Marian, Vasastan and the Avenue. All are places you encounter on our tours. You get a taste of both the port, city and the beautiful park environment. After a safety briefing and test drive, you leave together with our skilled and service-oriented instructors or with an authorized guide. Become “one” with your Segway – get the spirit! No experience needed. You´ll get safety instructions and will test drive before we leave. Helmets and reflective vest is will be provided. Safety first! Segway Authorized Tours Segway Authorized Tours meet a high standard for providing our guests a safe and memorable experience. We provide the highest quality tour. We are No1 Segway in the City. 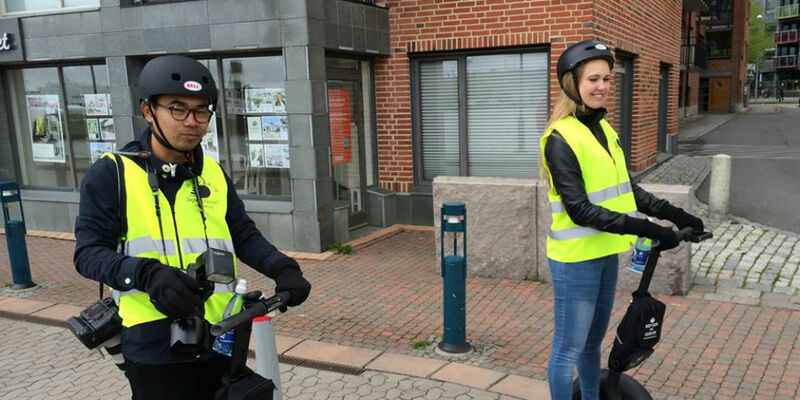 Authorized Tour operator by Segway Inc/Segway Nordic will deliver the utmost in safety and training – providing fun instruction, smaller guide-to-glider ratio, and in-depth knowledge of technical and practical usage.